I know many of you are busy mother's just like myself. I don't know if you are similar like myself but I hate scrubbing all my plates before I put them in the dishwasher! Come on you know you hate to pre-wash every thing by hand just so your dishwasher does not have to do much work because you did it all. I also despise when I open my dishwasher and realize all my glasses are filled with water spots. Raise your hand if that makes you upset?? I think you all will love the Cascade Platinum Pac's! They do great at getting stuck on grime and food, they dont leave the spots on your glasses, and they are still affordable. Check out Cascades Facebook page and join the #myplatinum instagram contest today! It would be so fun if one of my fans won that contest! Go enter so you can win- Enter† Cascade's #MyPlatinum Instagram Contest for a chance to win a KitchenAid® Kitchen Makeover and a 1-year supply of Cascade®! 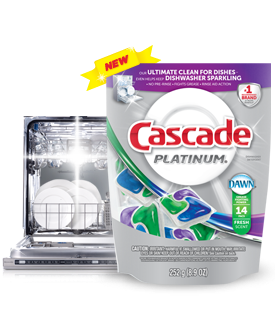 Weekly entries have a chance to win a KitchenAid® Dishwasher and six-month supply of Cascade® too!